Nanoxia released a slightly revised model of the first CoolForce series case – the CoolForce 2 Rev. B chassis. Improvements and optimizations were added to the case to improve user-friendliness and to incorporate new technologies into the chassis. The CoolForce 2 Rev. B addresses the issue with the fan filters of the older model. The CoolForce 2 Rev. B’s front panel is now a 2-part module wherein the fan filter can be accessed when the outer panel is pried open leaving the rest of the front panel in place. See image below. The dust filter on the CoolForce 2 Rev. B are separated from the fans making it easier to remove and clean. Access to the fans and radiator are now also facilitated differently. Nanoxia also improved the front I/O panel replacing the single USB 2.0 port with a USB 3.1 Type-C port along with two USB 3.0 Type-A ports. The LED lighting on/off button are also placed in the front I/O for easier control. 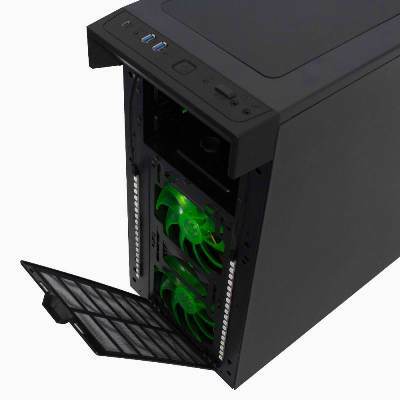 The Nanoxia CoolForce 2 Rev B. also features the versatile ModuWand, a practical “AirCover” on the top of the case along with two pre-installed Rigid LED bar at the rear portion of the front. For cooling, the Nanoxia CoolForce 2 Rev. B has three pre-installed cooling fans; two 140mm fans in front for intake and one 140mm fan at the rear for exhaust. The CoolForce 2 Rev B. supports graphics cards of up to 300mm in length, CPU coolers as tall as 185mm. Removing the ModuWand, it can extend support for graphics cards of up to 445mm long. There are eight PCI expansion slots giving enough space for multi-graphics card setups. The Nanoxia CoolForce 2 Rev. B will be available in stores by the third week of November with an MSRP of €84.99/ £73.19.